This blog is brought to you by our friends over at Orfi Media. 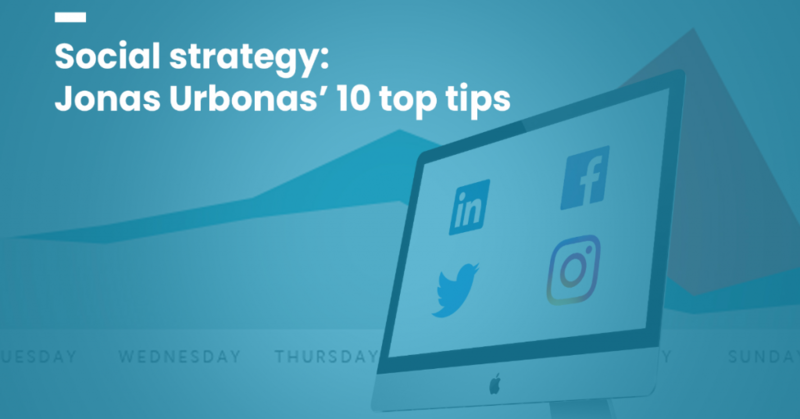 CEO, Jonas Urbonas explains to us reasons why strategy is so vital to your social media efforts and provides some actionable advice on how to get started. Social media is the great equaliser. No matter the size of your company, it connects you to your audience – a few quick clicks and you’re talking to the people that you rely on to make your company successful. And the glory of it is its simplicity. Anybody can enjoy its benefits. But it’s this very simplicity that lures business owners into a false sense of security. It’s so easy to just throw out posts as and when the fancy takes you, and then if and when you get engagement, bingo! Job done. That’s not the case. Sure it’s easy to do some social media, but it’s an entirely different matter to do social media well. The secret to good social media? Strategy. Every company – whether its one woman and her laptop in the bedroom of her parent’s house or a multi-national company with a thriving media team – should have a comprehensive social strategy. Here are 10 top ten tips for building a social media strategy that works for your business. Social media can be used to achieve different goals – and what you set as a goal drives the strategies you employ. Maybe you have a new product you want to increase awareness of? Maybe you want website click-throughs? Or perhaps you simply want to build your social following? Decide this beforehand, and use it to inform your strategy. If you want to build a following, think about offering value through humour or advice. For click-throughs, offer incentives. If you’re building brand or product awareness, get creative to avoid looking spammy. What your motive is doesn’t necessarily matter at this stage. What matters is that you define and understand it. An obvious point, yeah. We’ll accept that. But it doesn’t make it any less important. No amount of research is too much. The more you understand your audience, your competitors and the landscape that you operate in, the better you’ll be able to communicate to these people and bend them to your will. Identify five social media accounts that you think work really well, and five that you hate. Work out what it is about each that turns you on and off. Write it all down on a little graph if it makes you happy. The point is, you need to understand what you think works and doesn’t. And then you need to understand as best as you can what your audience thinks too. Once you’ve done this you can start to look at things like brand voice, brand personality, style, identity. Things you (should) have done for your brand on a wider level. So now you know what you want, and you know how you want to do it. All that’s left is to, you know, get it done. But don’t think you now have free reign to start spurting out content and posts. A solid social strategy is interlinked, with every post giving a little to the greater good. Or in other words, it follows a narrative. If you have a storyline for how you want to get from one point (now) to another (achieving your goal), you control the journey. That means providing highs and lows, contrast between posts, ensuring that every piece of content is relevant – creating an interested audience. Maybe you can try and tell a story and build a character over weeks? Or encourage audience participation to include people in your brand? Get creative, and if you’re successful you’ll have people checking in on your feed regularly, meaning they are more exposed to your message. Many social media workers will swear by scheduling and, sure, it has its benefits. But it has its downsides too. Nobody wants to spend their whole life managing a social media page. Scheduling allows you to put out content at the same time as having a breather and enjoying your life. Win. It also means you can plan ahead and make sure you don’t miss events and schedules that are linked to your field. Win-win. But here’s the rub. It’s been proven that scheduling websites affect the algorithms of social media platforms such as Instagram, meaning your posts will be seen by fewer people. Not only that, but they’re unreliable – everyone working in social media has felt the exasperation that comes from a carefully formatted post suddenly losing its structure when it appears on your feed. No, we can’t explain that. Yes, it’s infuriating. And finally, posts that have been planned and written in bulk a month before their posted are always going to appear a little wooden as opposed to more reactionary content. There’s no right or wrong answer. Try out scheduling and having no personal life, or maybe give a mix and match of both a crack. See what works best for you. No matter how proud you are of the shiny marvel that is your tone of voice best practice document, no two writers will interpret it the same. That’s a fact. If you have five different people submitting copy for your social media pages, it’ll come across on the feed. Maybe that’s how you like it. If so, happy days. But if you want a smooth brand personality that is consistent from post to post, it might be a good idea to have one person as your designated social media copywriter. This might seem like a lot of work, but it doesn’t necessarily have to be. Just have any other members of your social media team sourcing pictures, creating content, drafting ideas and leave the final edit and publishing responsibility to your designated Shakespeare. You’re smashing it. Your content looks great, reads great – damn it, it IS great! But your engagement is low. People aren’t playing ball. One great way to get people engaging with your content is to engage with their content first. Comment on Instagram posts. Like Tweets. Connect with people on LinkedIn. The more people see the human face of your company or business, the more likely they are to engage with it. Speak to people. You’ll be surprised at how quickly they’re speaking about you to others. It’s easy to fall back on what you find comfortable. The challenge is to get outside of that comfort zone and to keep your social followers guessing. Even good content can get boring if it’s constantly presented in the same way. So mix things up. Have a photography week where you let pictures speak for themselves. Experiment with animation or GIFs. Conquer your fear of selfie videos and speak to your audience directly. Your audience may come to expect something from you, and that’s fine – it may even be the reason they follow you. But like any good relationship, it’s important to spice things up every now and then. So get spicy. Video is Social’s best friend. Social video generates 1200% more shares than text and image content combined, per Wordstream. Viewers retain 95% of a message they hear through video, compared to just 10% from text, research by Wirebuzz has shown. By 2020, 80% of all internet traffic will be through online videos, according to Cisco. So yeah, video. Get on it. Strategy only goes so far. This may sound strange given the purpose of this article. But bear with us. Just because you’ve planned and researched and prepared the bejesus out of your strategy, it doesn’t mean that it will be 100% correct for every piece of content and every situation you face. It’s important to be flexible. Things change. The news agenda is ticking away 24/7. If something happens that you think it would be beneficial for you to react to or engage with, don’t worry about whether it fits the wider strategy – go for it. Pay close attention to analytics. Measure them against your stated goals. Whether you’re hitting them, under-achieving or over-achieving, question why. The only way your social strategy will improve is by constantly self-analysing what works and what doesn’t. And the great thing for you is that all the information you need to judge that is right there and built into the platforms you’re using. Get familiar with analytics tools and do your research. They’re a super-valuable tool, they’re free and they’re easy to navigate. In other words, there are no excuses not to. This isn’t an encyclopaedia of social strategy guruship. This is a complex subject, and what works can change from industry to industry, business to business. But they are a starting point. Thank you, Jonas, for sharing your top 10 social media strategy tips! Jonas is a digital designer, marketer and CEO / Founder of Orfi Media, a digital marketing and branding agency for the sports, health and fitness industry based in Manchester, UK.